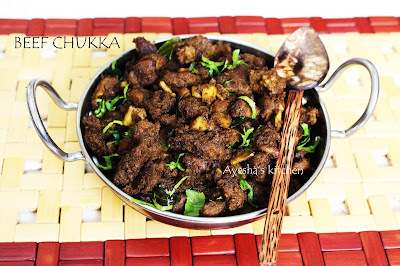 Beef chukka is a delicious dish with beef which is best when served along with steamed rice, chappathi, ghee rice. 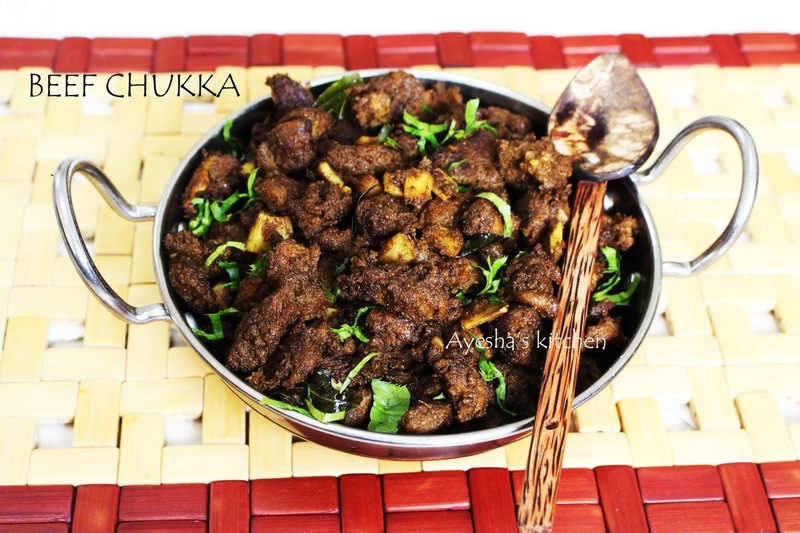 This is the very simplest and yet delicious beef preparation. Beef chukka is a popular and very common dry dish with beef in parties. Here the beef is well marinated with all those spices, pressure cooked and then sauteed in onion gravy until each piece of beef is well coated with the gravy in a low flame. Hope you all will love this recipe and do try. 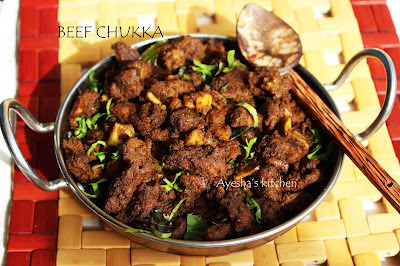 Lets see how to make beef chukka varuval . Make a fine paste of coriander powder, turmeric powder, red chili powder, pepper powder, tomato, fennel seed, ginger garlic paste in a grinder. Marinate the chopped and drained beef pieces with this paste along with some salt. Pressure cook it until 3 whistle or until 80 % done. Now heat a pan with coconut oil. Saute the finely chopped onion, coconut slices until done. When done, add the cooked beef along with the gravy. Heat on a high flame for 5 minutes and stir continuously. Then reduce the flame to medium low and cook for 25 minutes or until each piece of beef is well coated with the masala. When done garnish with chopped coriander leaves. Serve along with steamed rice or ghee rice.